Arguably one of the most popular “attractions” in the Pennsylvania Wilds, elk inhabit North Central Pennsylvania. Within this area known as Elk Country is the epicenter, a small town called Benezette. Thousands of people visit Benezette every fall to witness the elk take part in their annual breeding season, called the rut. The elk are vocal by creating a series of sounds commonly referred to as bugling, grunting, mewing, etc. To kick off this season every August, the Elk Country Visitor Center hosts the annual Elk Expo in Benezette. The event brings in people from all over the state and country to enjoy educational seminars, great food, live music, vendors of all kinds, and the prized drawing of elk hunting tags that are awarded to a limited number of lucky individuals. For two days, a multitude of seminars are held to help everyone understand and learn more about the wild animals and places that northern Pennsylvania has available. For example, the PA Trappers Association hosts demonstrations and an exhibit, the PA Game Commission shows how they are able to trap a black bear while demonstrating how they record and process the animal prior to releasing it. Vendors were plentiful and ranged from paintings, log home building, archery pro shops, food stands, game calls, crafts, carvings, outfitters and much more. The Elk Expo has a little bit of everything for anyone of all ages. In addition, elk biologist for the Pennsylvania Game Commission, Jeremy Banfield gave a very detailed and informational presentation on the Pennsylvania elk herd. Jeremy’s presentation was a perfect segway into drawing the 125 coveted elk tags. The Pennsylvania Board of Game Commissioners approved of 26 antlered and 99 antlerless elk tags for the 2018 season with well over 25,000 applicants. The elk herd is getting stronger every year, which is the reason for the continual increase in the number of tags allotted each year. Hunting is a necessary part of the managing the herd to ensure that it continues to thrive for generations to come. On Sunday, they raffled off the 5th annual Conservation Elk Tag, which is used to raise money to continually improve the elk habitat and management efforts. This tag gives you a chance at a record 400+ class bull, 56 days to hunt and an opportunity to hunt across any of the open elk zones. Although the chances are low of winning this tag, I will never have a problem donating my $25 to conservation efforts. 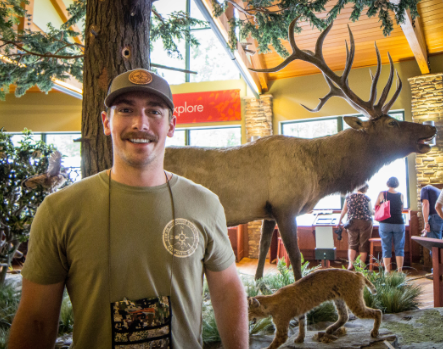 The Elk Country Visitor Center is a great place to learn about elk, their history, and much more. You can explore their viewing trails, take part in their 4-D theater experience and support elk conservation through the purchase of Elk County items in their gift shop. During the summer and fall months, the visitor center is open 7 days a week with limited days during the off-season. In addition to the visitor center, there are local restaurants, wineries and stores in the area that will give you that small town, welcoming feel. The 2018 Elk Expo was held on August 18-19 and endured a variety of weather, from blue bird skies and sunny weather to clouds and thunderstorms. 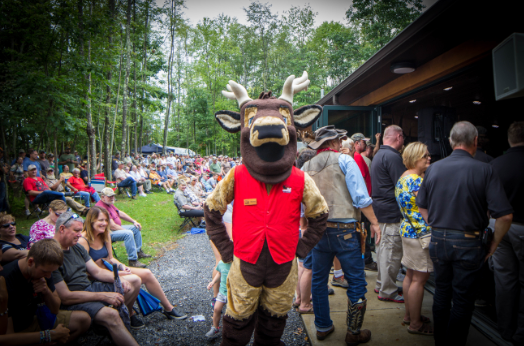 Through it all, visitors continued to flood through the event and enjoy celebrating how lucky we are to have a successful reintroduction of elk to Pennsylvania. If you haven’t attended the Elk Expo before, mark it on your calendars and rent a cabin for the weekend next year for a great family experience. In the meantime, I would highly recommend visiting Elk Country this fall to witness the elk rut for yourself! Beau is a bowhunter, outdoorsman, and conservationist. He grew up in the heart of the Allegheny National Forest, and found out at an early age that the Appalachian Mountains would consume all of his spare time. He’s driven by adventure and shows it through his latest business venture, East Meets West Outdoors. His goal with East Meets West is to help others experience adventure hunting in wild places from the Rockies to the Appalachian Mountains through the East Meets West Hunt podcast and blog. In addition, Beau has written for multiple magazine and online publications surrounding his adventures, such as Petersen's Bowhunting Magazine, The Journal of Mountain Hunting, Heather's Choice blog, MTN OPS Rally Point and the PA Wilds. You can find more info at www.eastmeetswesthunt.com.